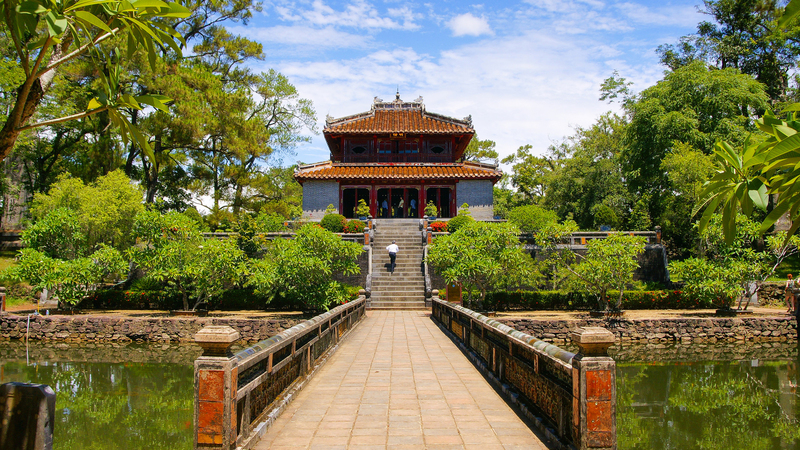 About 14km South of Hue, the tomb does not only host King Gia Long but also contains a large group of tombs for the King’s family and relatives. Gia Long tomb is a bit further away from Hue downtown area. One can go by boat along the perfume river about 18km and land at the wharf of the tomb. The land where the tomb was built to Huong Tho commune, Huong Tra district, Hue. The tomb does not only host King Gia Long but also contains a large group of tombs for the King’s family and relatives. Those tombs were built over 17th and 19th century and recognized as one of UNESCO World Heritages. Speaking of the King and Queen tomb alone, they were built over a period of time that saw the come and leave of three different kings. Gia Long is the most distant tomb compared with other emperors’ tombs but it is the most scenic and impressive with regard to natural landscape. There is no complicated building nor extravagant palace. The tomb complex was fenced by mountains and hills. The steles for King and Queen are parallel and share the same size. On top of the steles are coal-black roof. The simple yet elegant steles are said to symbolize and love and loyalty of the King and the Queen in war and peace. Though being the most distant tomb in comparison with those of other kings, Gia Long Tomb is the most scenic and impressive with regard to natural landscape of boundless mountains, pine forests and paths among grass and wild flowers. There’s no complicated building or extravagant palace but a complex fenced by 42 mountains and pine hill, named after the biggest mountain of the complex: Dai Thien Tho. The tomb is divided into 3 main parts. In the middle stand the tombs of the King and Queen. After the Honour court and up on the hill top is Buu Thanh, containing symbol of happiness and longevity. On the right of the complex is Minh Thanh Temple, where the King and his wife are honoured. Formerly, here’s the place to display artefacts related to the king’s military life. On the left is a stele pavilion, with 2 parallel coal-black roof steles for the couple. Those simple yet elegant stles are said to symbolize the love and loyalty of them throughout war and peace. However, due to war and time, only the left stele remains. There’re 2 ways to reach Gia Long Tomb, which is really a remote spot, even for local people. One is travelling by boat along Perfume River, which can be taken at the wharf at city downtown. The boat trip is really worth a try, since it provides a unique chance to capture the scenic landscape of upstream Perfume River. The other method is to go 16km by car or motorbike to Kim Ngoc Wharf (from Thieu Tri Tomb, go along the riverside road for about 3km) and take the boat there. It’s more convenient if tourists take motorbike as the boat can carry them along to the site. However, the road is not in very good condition. In case of travelling by car, people have to walk for some kilometers (depends on where the boat lands them).